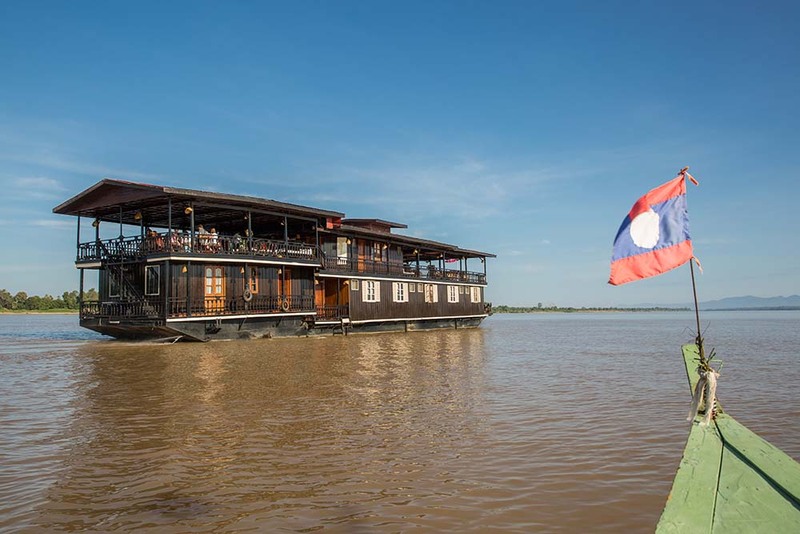 Originally a ferry that carried teak wood between Vientiane and the south of Laos, in 1993 the Vat Phou boat was lovingly converted into a luxurious floating hotel, cruising the Mekong river. 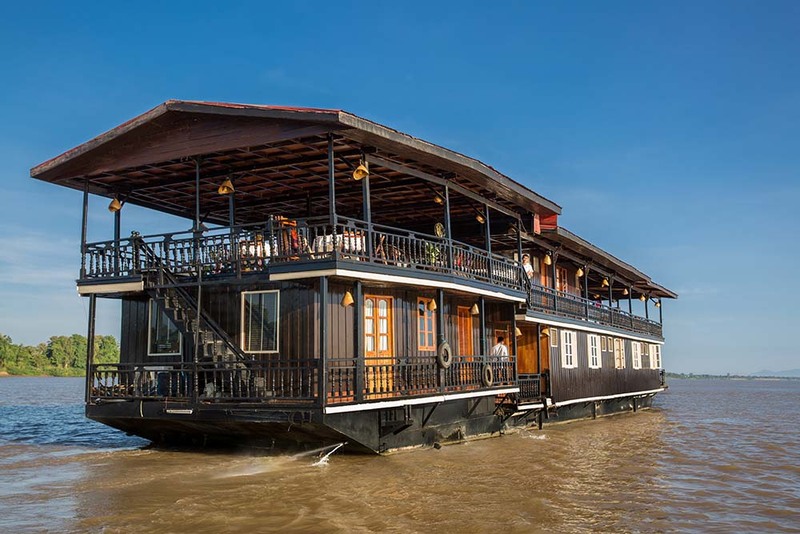 The Vat Phou boat is a 34 meter long, 7.5 meter wide steel hulled teak barge, equipped with two 260 HP Isuzu diesel engines. 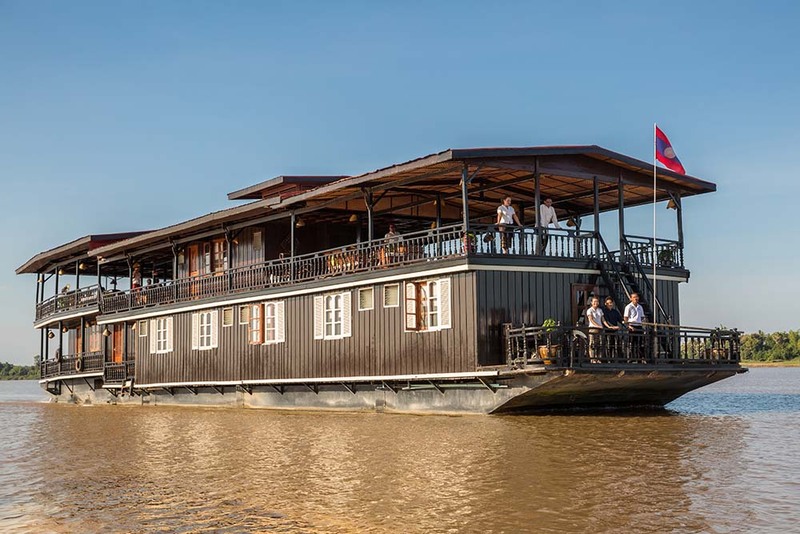 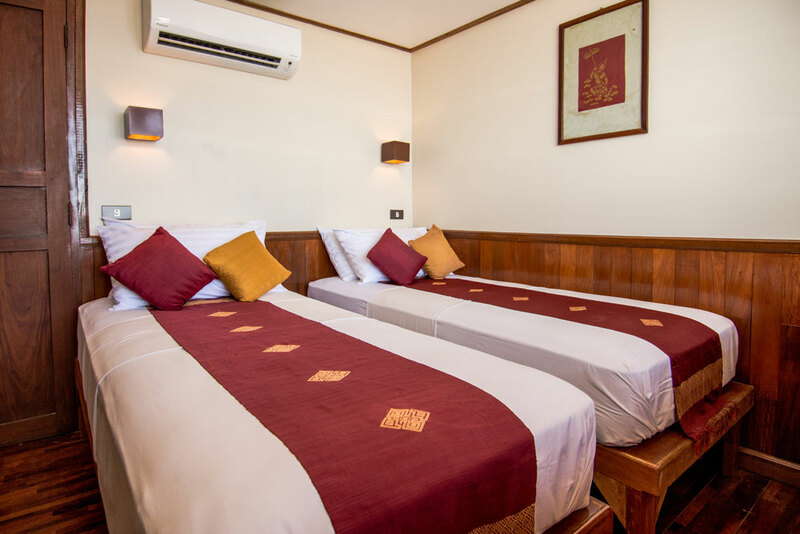 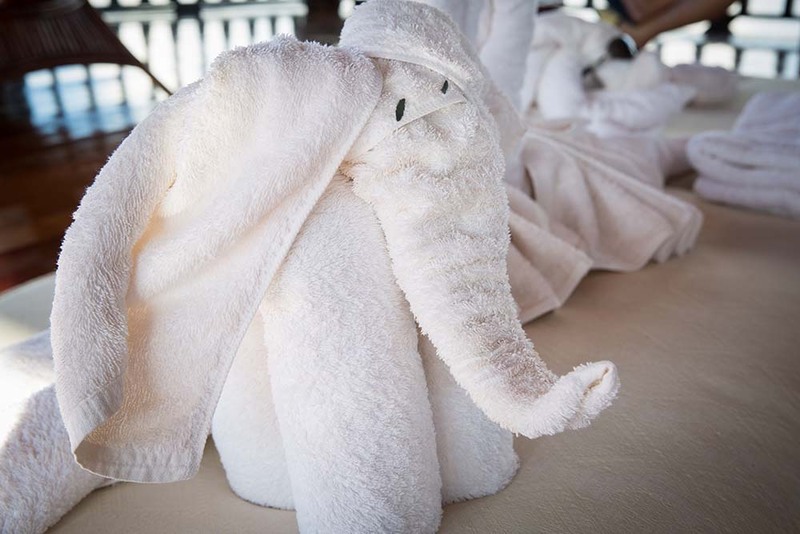 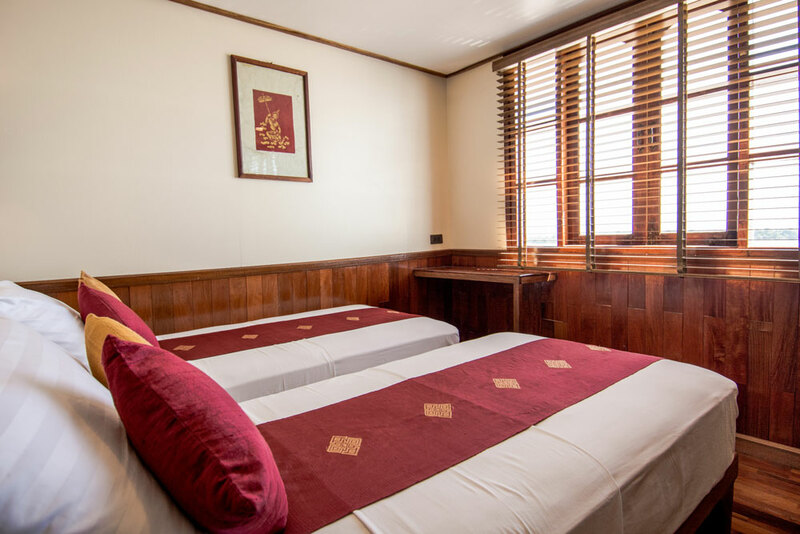 The design retains a character that is unmistakably oriental and enables you to relax in comfort while you cruise the Mekong, you enjoy the ever changing pageantry of river scenery and life as you pass smoothly by. 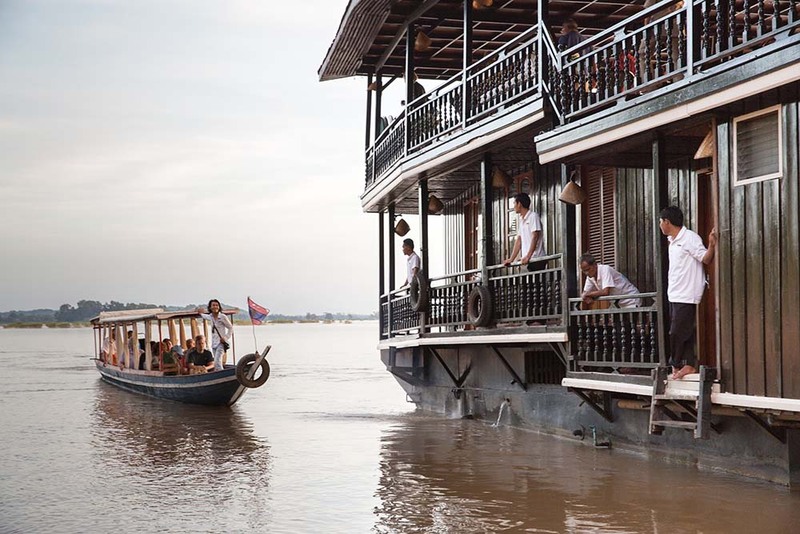 We have 14 staff on each Mekong cruise departure. 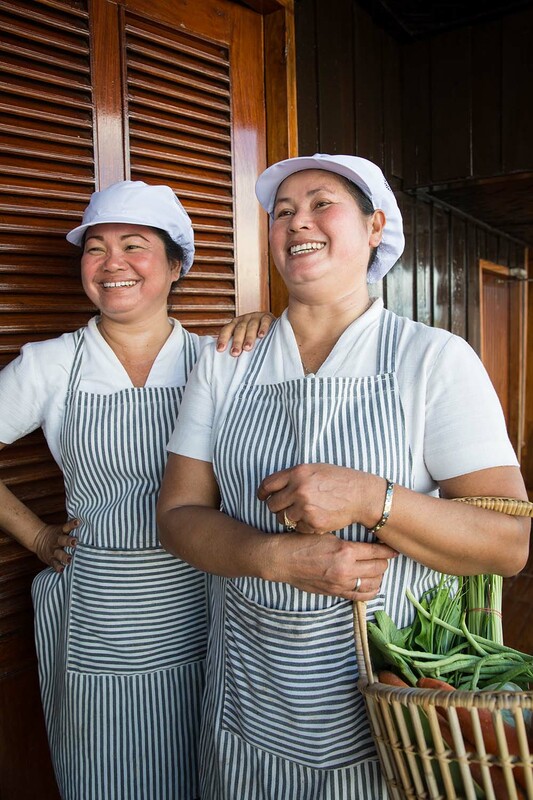 This includes 2 full time captains, 2 mechanics, 2 cooks, 3 cleaning staff and 5 bar or wait staff. 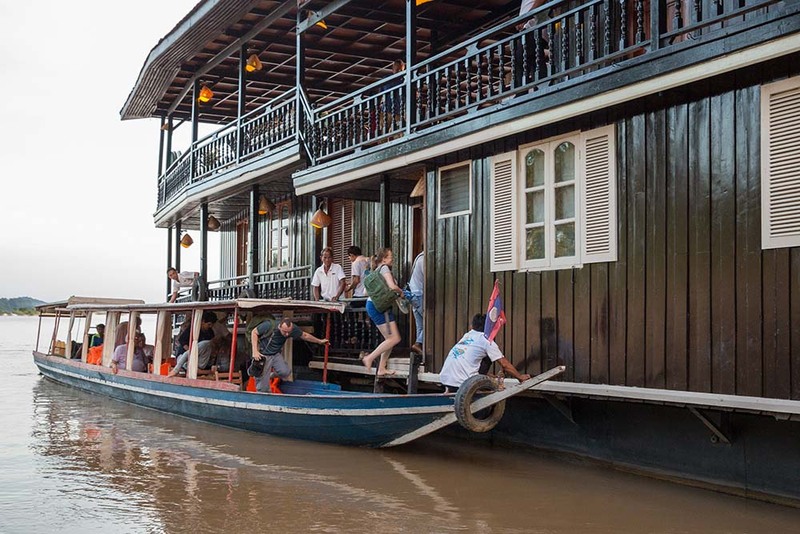 We also have on board an English and Thai speaking guide who can help answer any questions and point out interesting sights along the way. 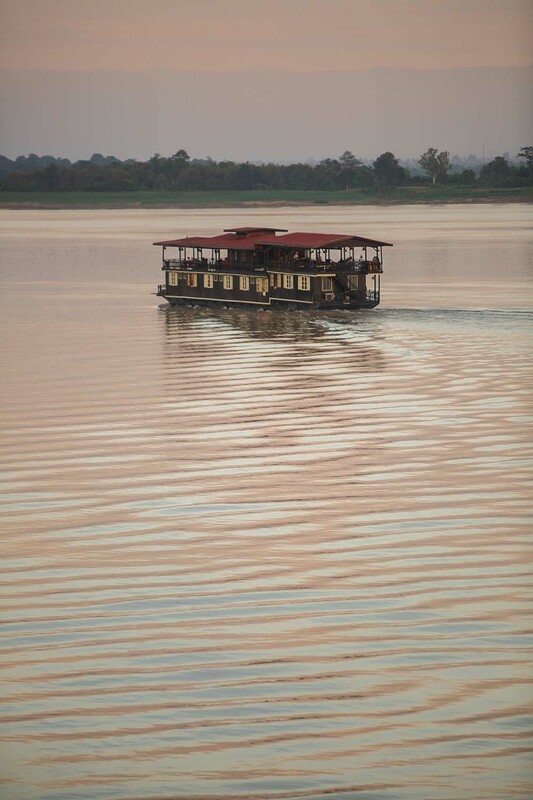 There are two decks on the Vat Phou boat. 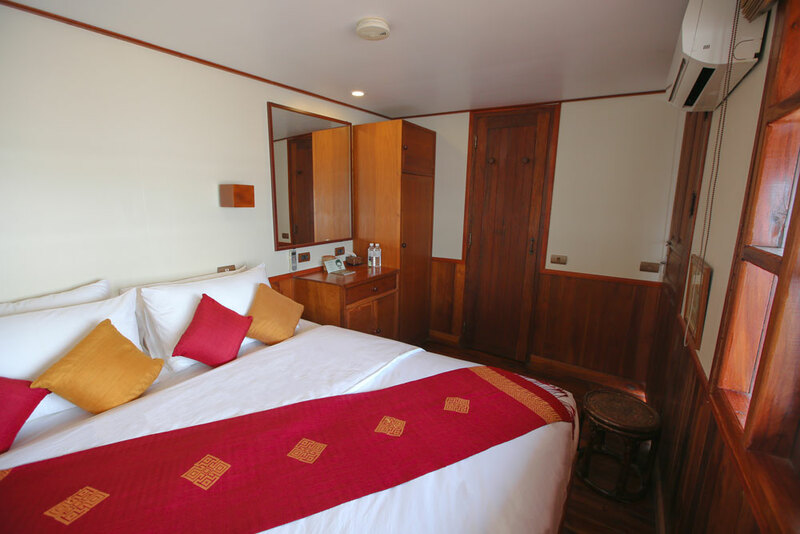 The lower deck has 10 cabins, the kitchen/galley and our evening air-conditioned dining room. 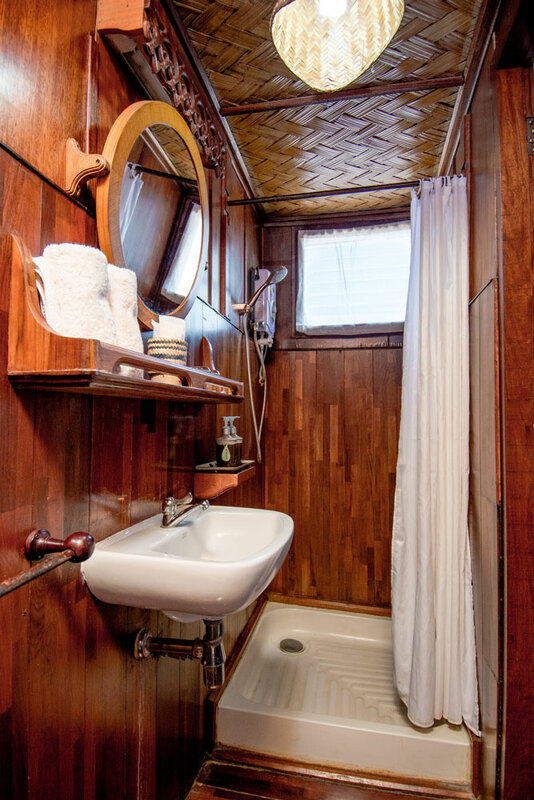 The upper deck has 2 cabins, the bar and a two large open air shaded decks – one at each end of the boat. 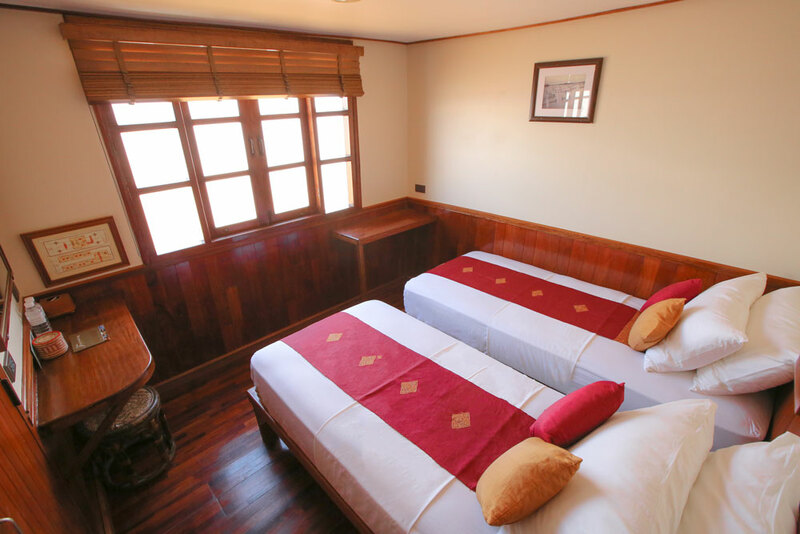 The ship is fully equipped with safety equipment meeting international standards. 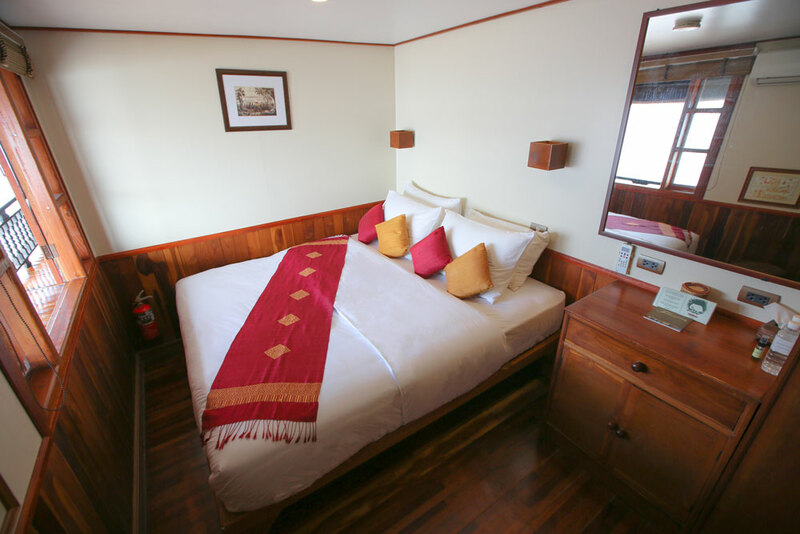 The front upper deck has rattan armchairs, sofas, coffee tables and lounges. 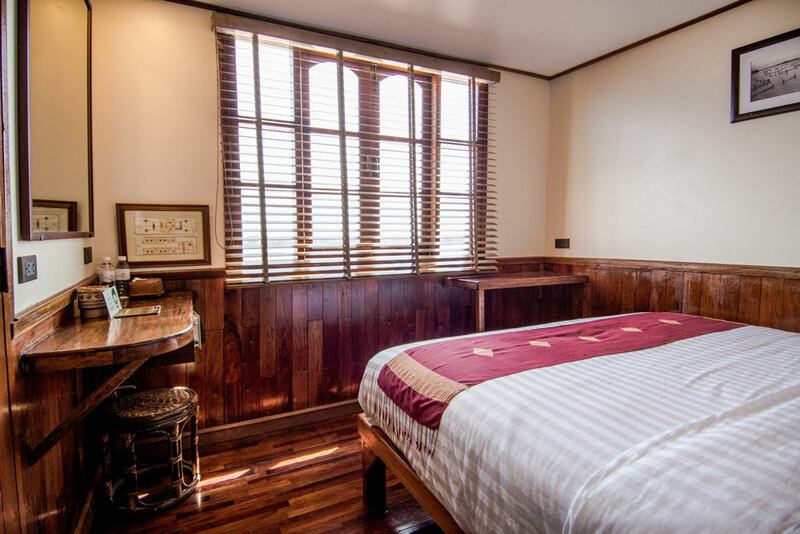 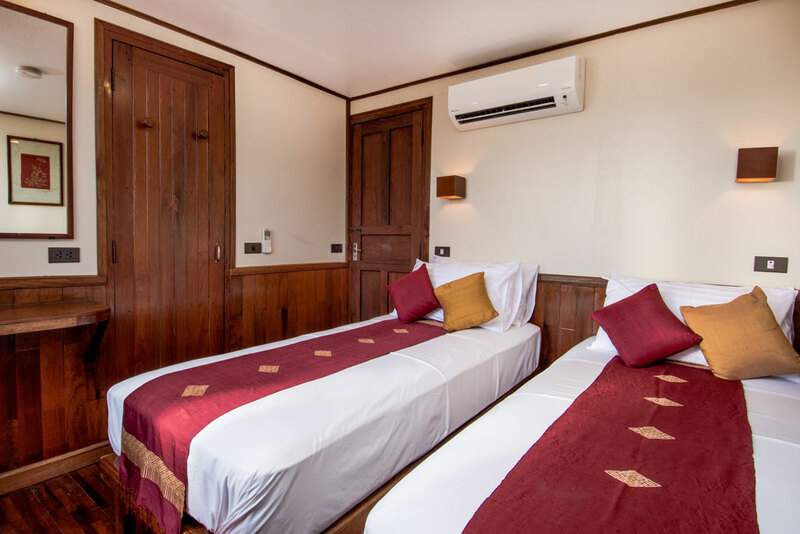 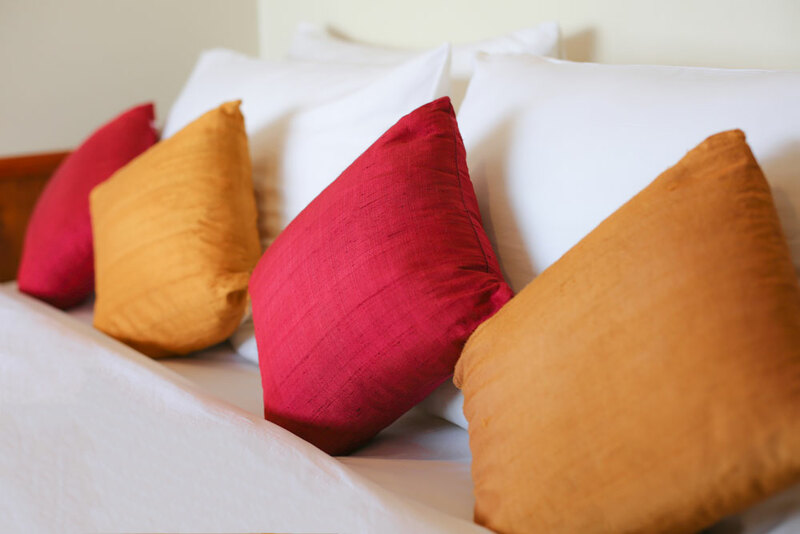 This area is perfect for lying back to read a book, taking photographs of life along the Mekong River or having an afternoon nap. 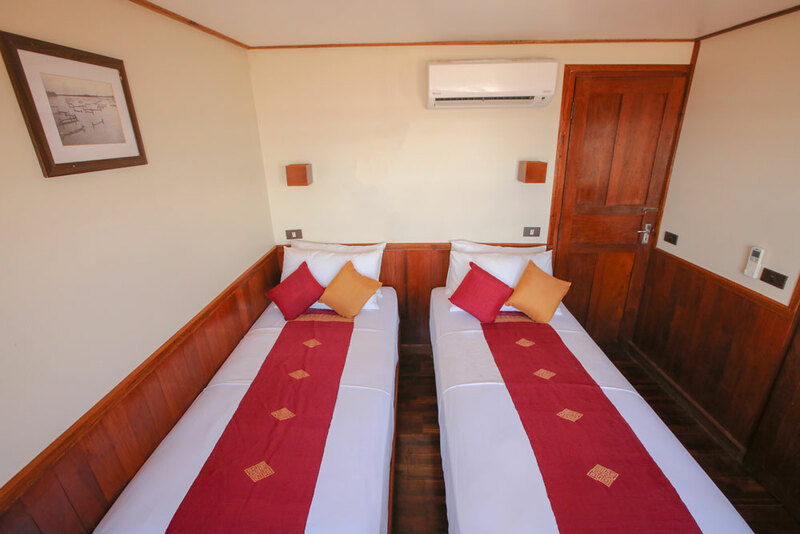 The rear upper deck has chairs, sofas and coffee tables. 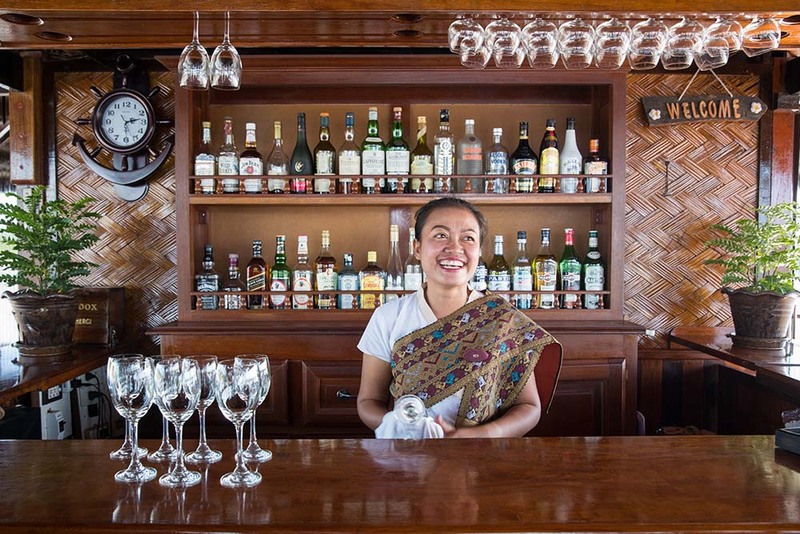 We also have the bar area here where our staff can serve you tea, coffee or drinking water, which are all included free during the cruise. 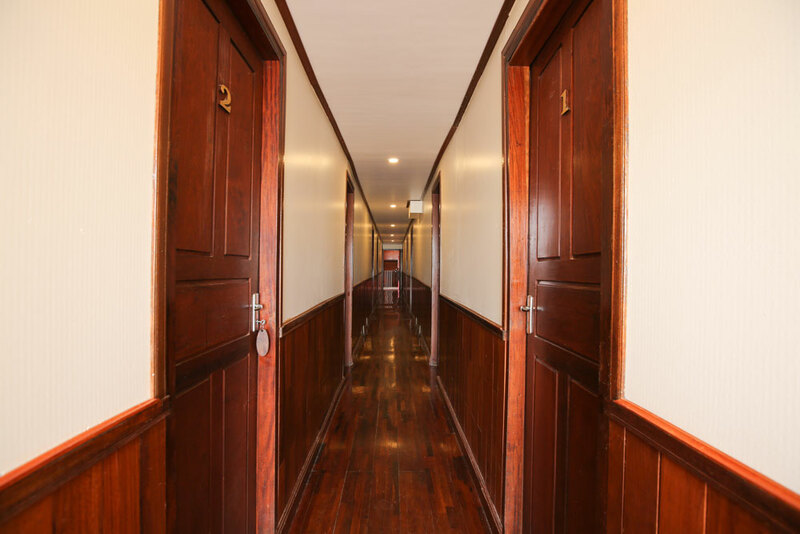 You are also able to purchase beer, soft drinks, wine and spirits. 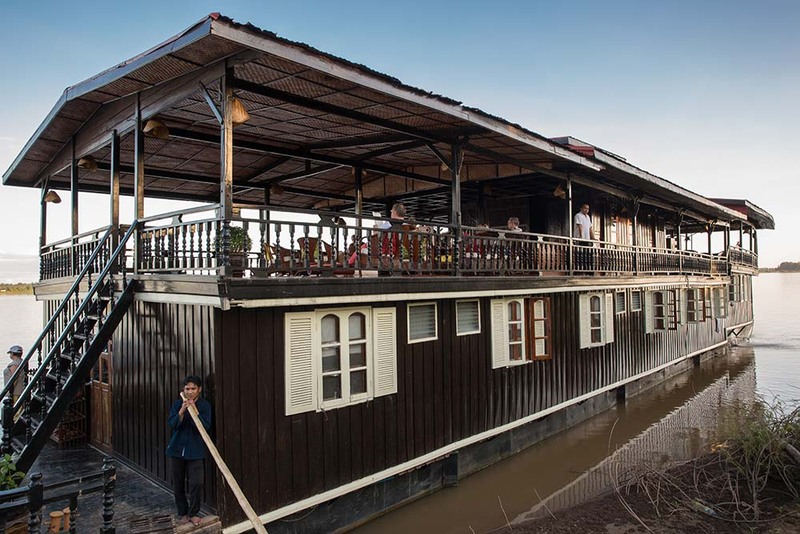 Breakfast and lunch are usually served here, watching the sun dance on the waters surface. 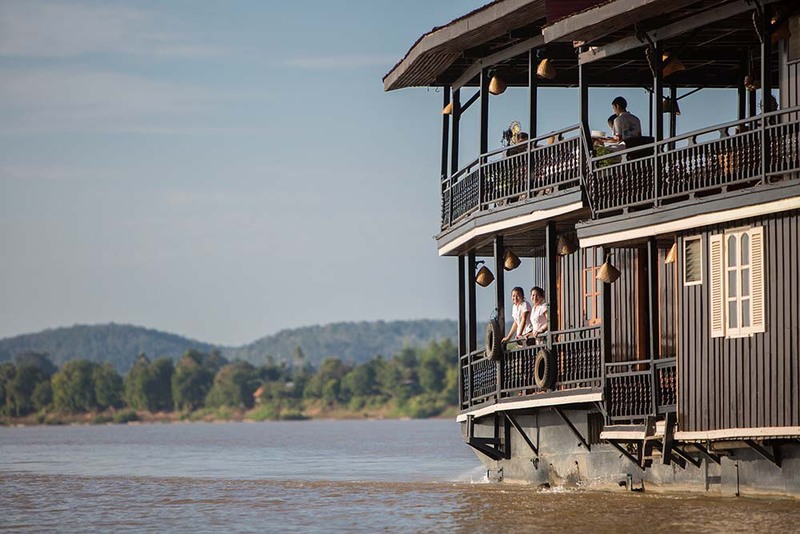 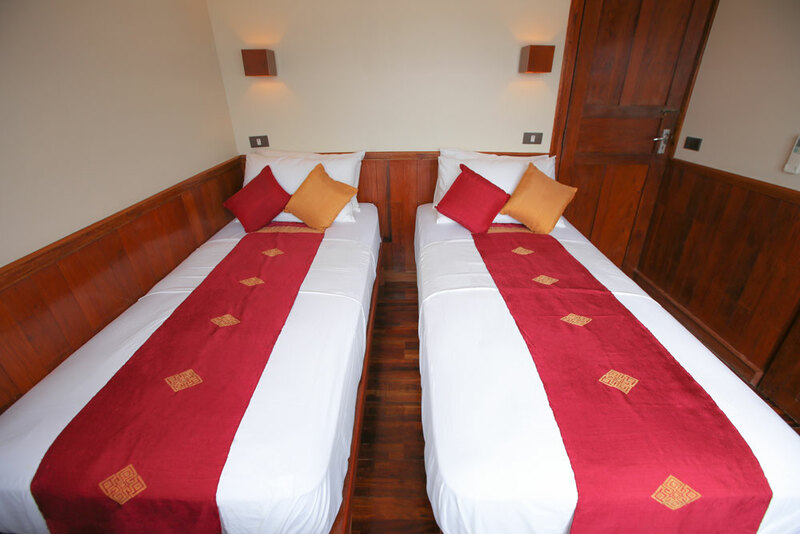 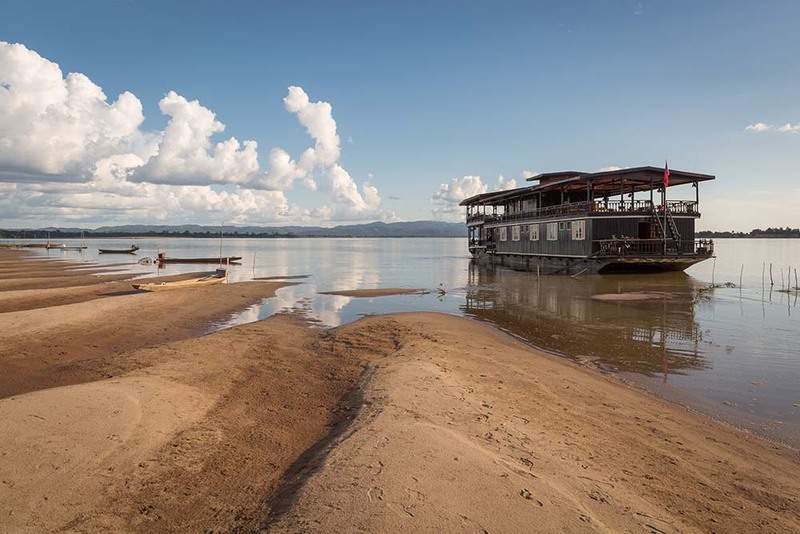 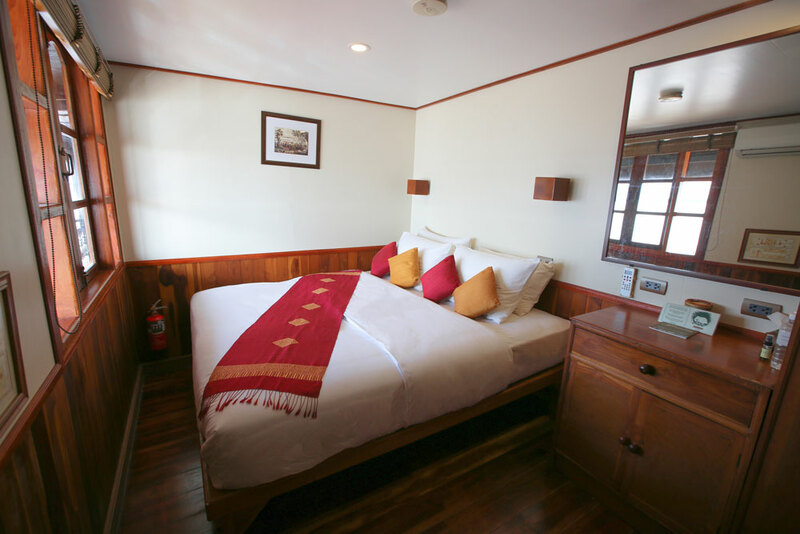 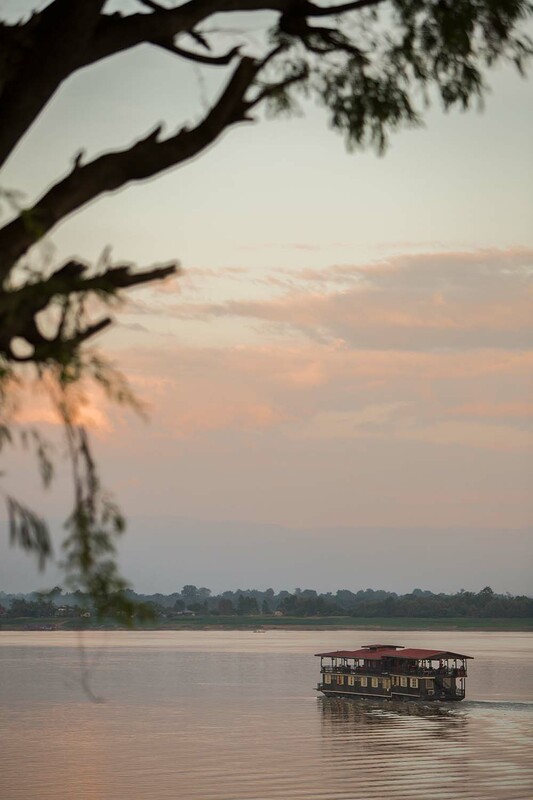 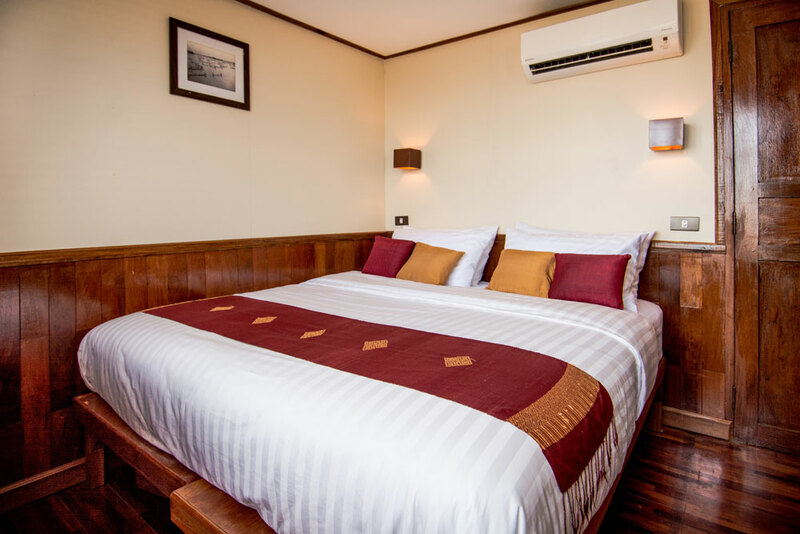 The Vat Phou boat has 12 elegant twin shared cabins, each with a view over the southern Mekong River in Laos. 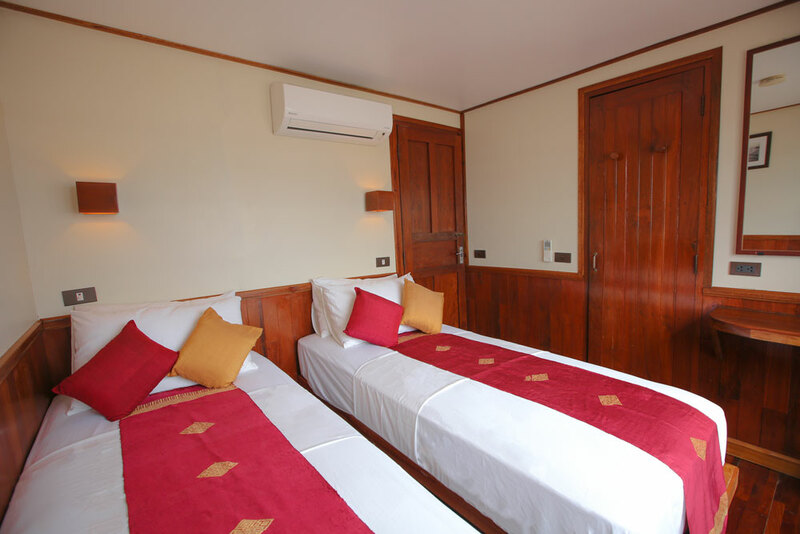 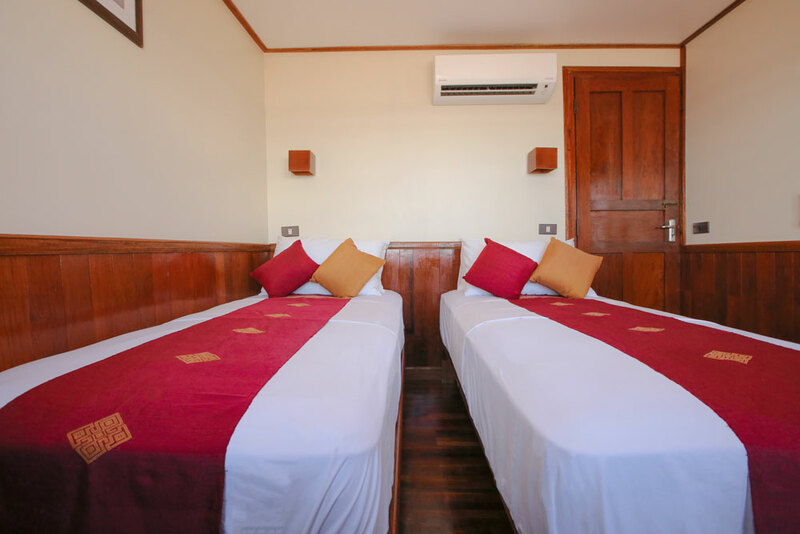 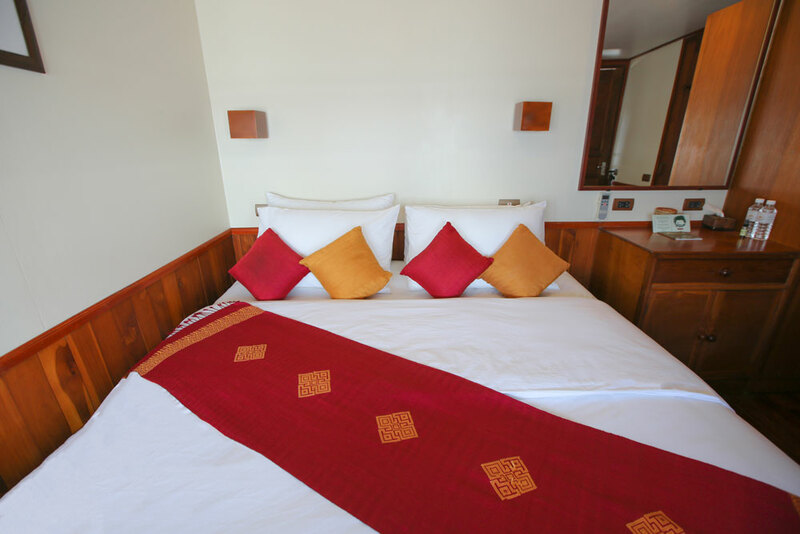 Every cabin is fully air-conditioned and also has a fan for optimum temperature control. 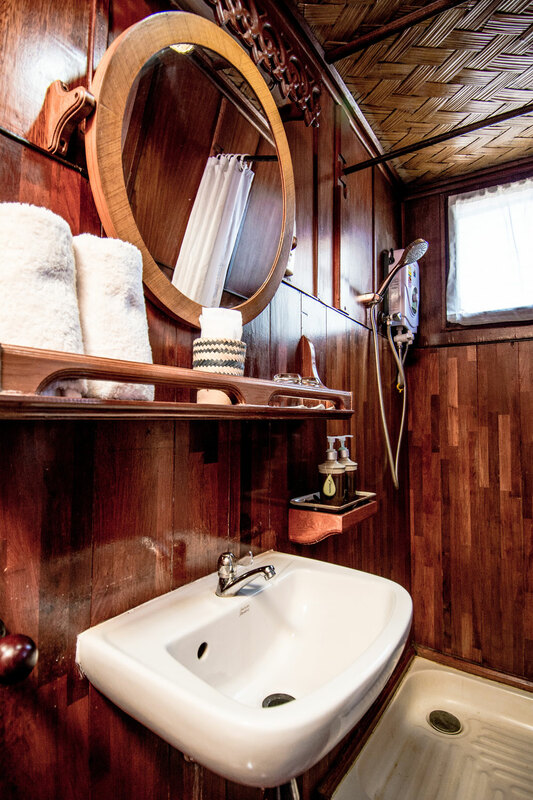 The cabins are fitted with dressing tables and a wardrobe so you can unpack easily and relax. 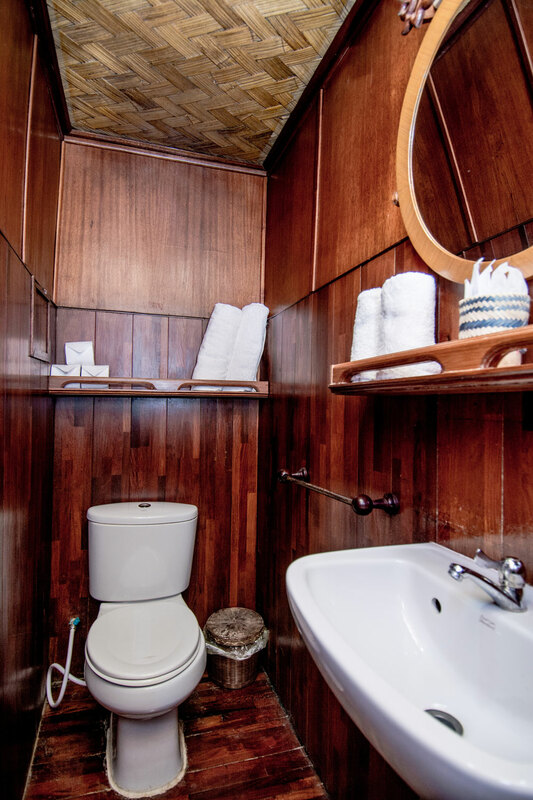 The private bathrooms have a hot shower and a western style toilet for your convenience. 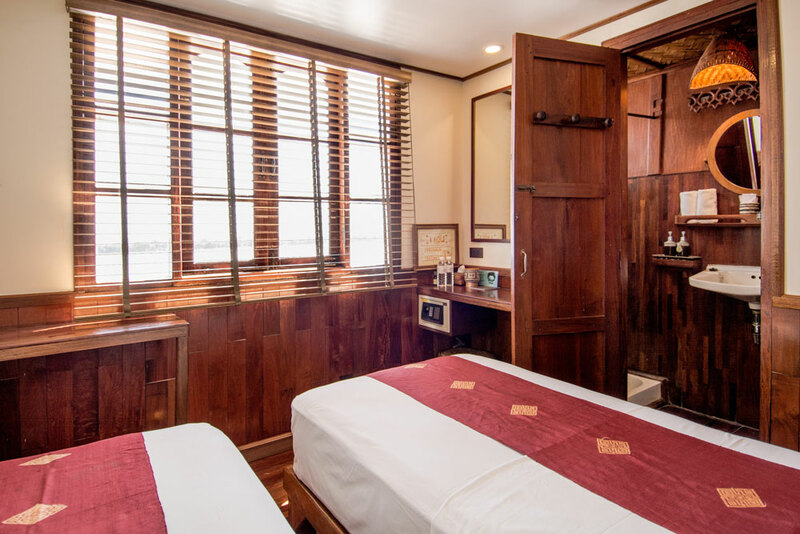 Our Vat Phou staff clean your cabin daily. 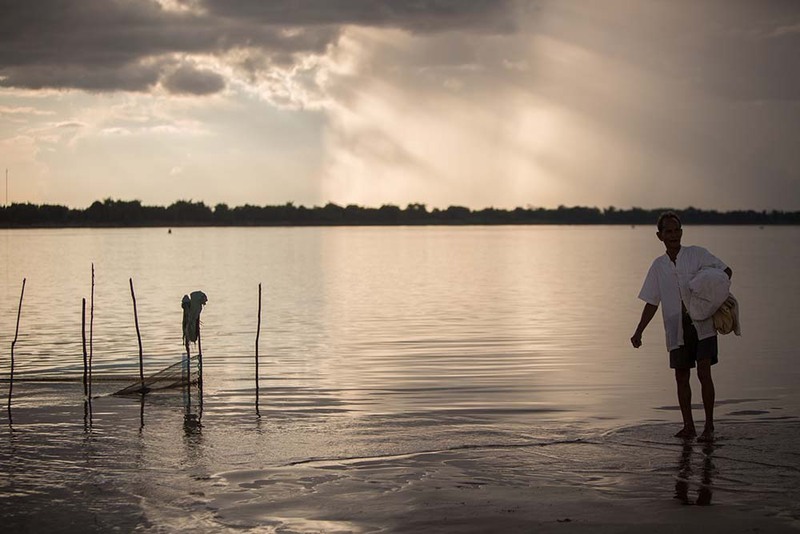 Life jackets are available in a variety of sizes including children’s sizes.